StarFax™ Personal from Star2Star Communications adds cloud-based desktop faxing to your Star2Star system. StarFax™ Personal users can send and receive high-quality faxes to and from their desktop or laptop computers without the requirement of making a printed copy with or without the need for a physical fax machine. StarFax™ Personal is the modern, environmentally friendly way to incorporate fax into your business workflow without paper, ink, or power hungry fax machines. 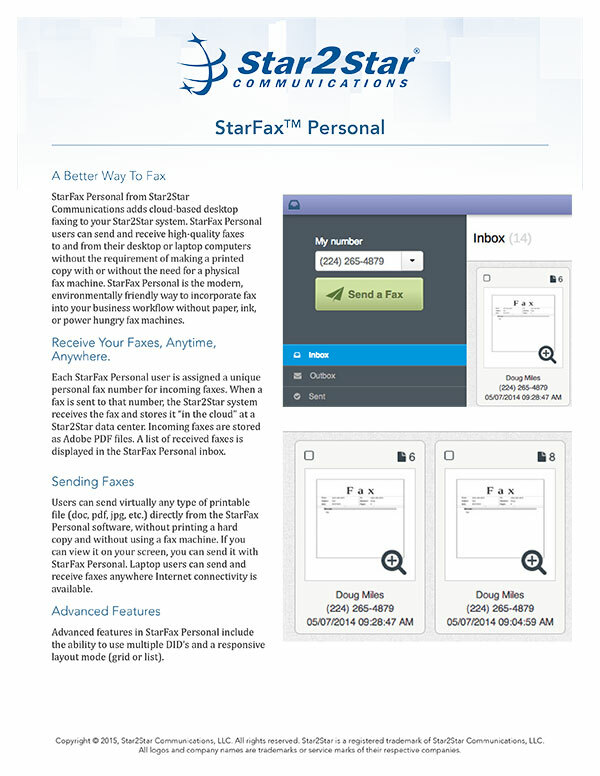 Each StarFax™ Personal user is assigned a unique personal fax number for incoming faxes. When a fax is sent to that number, the Star2Star system receives the fax and stores it “in the cloud” at a Star2Star data center. Incoming faxes are stored as Adobe PDF files. A list of received faxes is displayed in the StarFax™ Personal inbox. Users can send virtually any type of printable file (doc, pdf, jpg, etc.) directly from the StarFax™ Personal software, without printing a hard copy and without using a fax machine. If you can view it on your screen, you can send it with StarFax™ Personal. Laptop users can send and receive faxes anywhere Internet connectivity is available. Advanced features in StarFax™ Personal include the ability to use multiple DID’s and a responsive layout mode (grid or list).